Another important feature of TEAM-FF is its capability for integrating external force fields. There are many force fields published in the literature, it is of great significance if those force fields can be used together in one platform. However, different developers use different notations of atom types, and different force fields have different (usually limited) coverage. DFF provides a common interface to integrate different force fields into TEAM-FF. A force field has three components �C force field type (e.g. TEAM, AMBER, CHARMM, CFF, or DREIDING), definition of atom types and list of force field parameters. 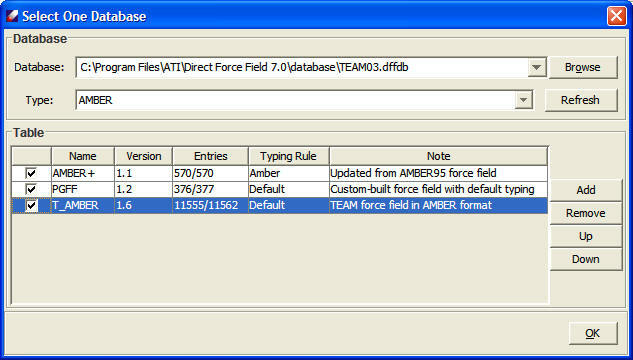 An external force field can be imported to TEAM-FF as long as its force field type is supported by DFF. The atom types are of central importance as they are used to identify parameters. Novel techniques implemented in DFF provide definition of atom types and enable integration of external force fields in a user-friendly way. The following screenshot shows that three force fields in AMBER format are used together, two of them are external force fields.